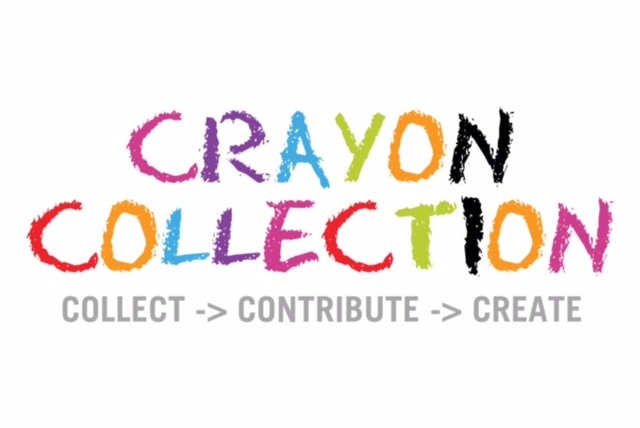 The Crayon Collection Artist Inspiration Series partners with artist volunteers who work with children to provide a curriculum of art education using reallocated crayons. The curricula takes crayons beyond just coloring. 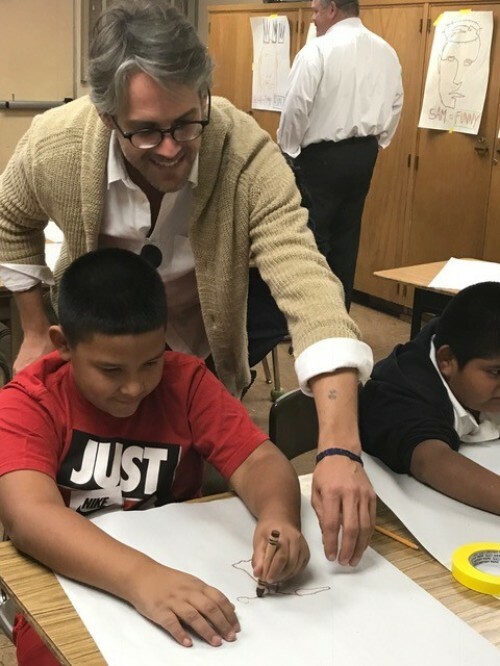 Recently, we took a trip with artist Alexander S White to Parthenia Elementary in North Hills, California bringing the class an interesting project using gently used crayons. 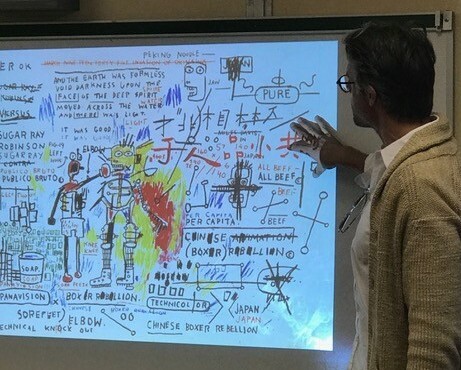 Alexander taught one of his favorite techniques of blind contour drawing to create portraits inspired by artist Jean-Michel Basquiat. Shortly after our trip their teacher revisited the lesson plan prepared by Alexander and available through our website. 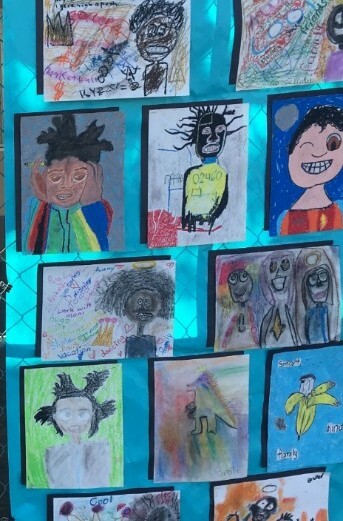 The kids responded with stunning works that reveal a depth none of us expected. You’ll be as impressed as we were with the detail and design these amazing students came up with. Not only has Alexander been an inspiration to children and teachers across LA but he’s also inspired us with his incredible talent, and dedication to both the students and Crayon Collection. That’s why we’ve chosen to honor Alexander S White as our 2018 Hero Award Honoree. 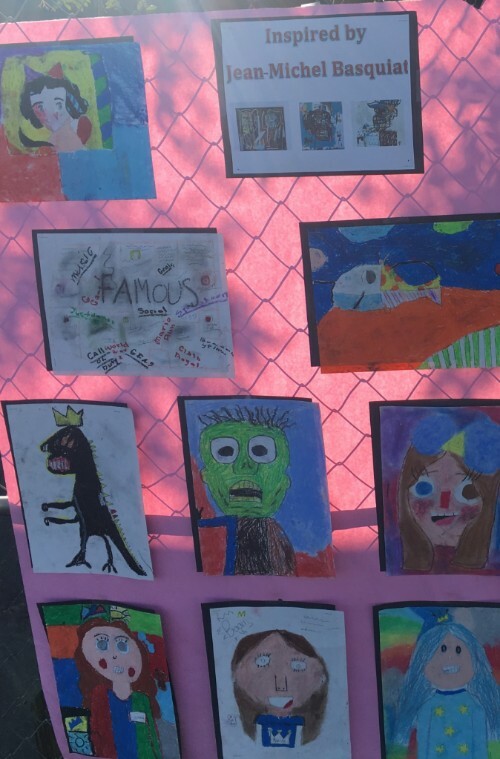 Please join us in celebrating his vision and volunteerism as well as enjoying the wonderful works by the Parthenia Elementary class seen below. Alexander S White – Our upcoming annual fundraiser, the Arts and Education Luncheon, sold out in record time thanks to our generous donors. We’re thrilled to be celebrating our Arts and Education achievements, including the many students inspired by Alexander’s talent and energy. Crayon Collection has been working hard to not only get crayons to vulnerable kids and schools, but also to get standards compliant curricula into classrooms as well. We know that funding for arts in schools has vanished in Los Angeles, and with your help and the help of artists like Alexander, Crayon Collection is changing that for the better. Support our Artist Inspiration Series and donate to Crayon Collection today!